Brittany C. began her recovery journey with CODAC after being released from the Crisis Response Center for suicidal thoughts in 2006. Her mental health and substance use history had her cycling in and out of treatment facilities and feeling depressed, angry and isolated. "I was a mess and I refused to admit that there was anything wrong with me," she shares. For a long time, Brittany struggled to figure out exactly what was going on with her mind and emotions. Eventually, she was diagnosed with bipolar disorder that she had been attempting to manage through drug use. 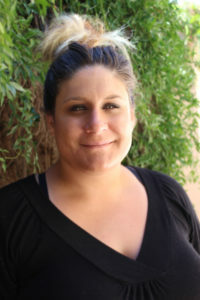 Brittany began treatment at Las Amigas, CODAC's Residential Treatment Program for women with substance use disorders. With the right combination of medications, therapy and support, she began to feel more stable. "The staff made me feel cared for as a person. My recovery coach helped me find resources, held me accountable and saw something in me that I didn't know was there," she says. With the guidance of her Recovery Coach, Brittany was provided tools to better manage her life. These included bus passes (to get to her to treatment sites, appointments, and to find employment), support finding a job, and even permanent housing. "Setbacks, like the threat of eviction, really held me back and sometimes caused me to relapse," shares Brittany. "It's so much easier to stay sober when you have help keeping a roof over your head." Brittany is feeling more confident as she moves forward in her life. She is now employed at a local fast food restaurant and regularly attends outpatient support groups and therapy. She is navigating the next steps to regain custody of her oldest daughter and just recently gave birth to her second child. "CODAC has wrapped their arms around me and supported me with primary care, case management, medication management, family and job support. I feel like a weight has been lifted off of me and it's been a long time since I have felt hope," she says.